Al Pacino never had a role as tailor-made to his gift for over-the-top, on-the-edge histrionics than he did in “Dog Day Afternoon.” His Sonny is unique for the way he mixes comedy and pathos, screaming profanity one moment, quietly sympathetic and almost soulfully gentle the next. “I speak what I feel,” he tells a teller who asks him to watch his language, but he’s obviously sensitive to what people think of him, even when he’s pointing a gun at them. “Dog Day Afternoon” is really Pacino’s baby. The film exists to serve his art. The fact he’s great in it is almost incidental. Of course he’s great in it, he’s a great actor in a movie that puts all the focus on him. But how good is it otherwise? Pretty to very, depending on which part of the movie you are watching. The film is better at the outset and in the middle than in the end, where it gets sloppy in its emotions and reaches beyond the bank for its storyline, dulling the focus. The central premise, a holed-up duo of ne’er-do-wells taking on the city, works as underdog formula for a while, especially when Sonny faces down the police by screaming “Attica” and making them put their guns down. The bank employees are fleshed out nicely with the help of Sully Boyar as the bank’s manager, Penny Allen as the head teller, Marcia Jean Kurtz as a gum-snapping teller, and Carol Kane as the “squirrel” who gets a call from her husband asking what he should do for dinner while she’s a hostage. Pacino’s “Godfather” mate John Cazale, in a velvet suit of fire engine red in case you were wondering what decade this was made in, is there as buddy Sal to provide steely backup as Sonny holds up the First Brooklyn Savings Bank. When John Cazale is the muscle man, your plot is definitely in trouble, and Sal and Sonny quickly find themselves surrounded by about four thousand members of New York’s finest. The dialogue has a very improvisational feel to it, which along with the strong characterization and frequent humor gives “Dog Day Afternoon” much of its watchability. You really feel like you are seeing this botched robbery happen as it goes down, in real time. There’s a nice use of suspense, too, the first time you watch it. Sonny’s so out there that you never know what, if anything, will set him off in a homicidal rage. And you know Sal really wants to start dumping those bodies out the door. So even though you can count the number of gunshots in this movie with one hand (and have enough left over to snap your fingers with), you are nervous all the way through. It does feel like the New York Police Department are a little too much out in force; was August 22, 1972 a good day to commit a crime in one of the other four boroughs? The police and the FBI are seen as unreasonable heavies, but Vietnam veterans and homosexuals probably come off worse, not to mention former Goldwater campaign activists. As far as the gay thing goes, it comes across as a bit silly when we see a group of over-the-top drag queens show up at the police barricade to cheer on sister Sonny, but the phone conversation between Pacino and Chris Sarandon as his lover Leon is among the movie’s most affecting scenes. Sarandon is really good at playing a total human mess who actually is a voice of relative reason in Sonny’s world. Can’t get over how young Pacino looks. He reminds me of Matthew Broderick in “WarGames.” Funny that one of the FBI agents here is played by Matthew’s father. Matthew’s father is in another classic ’70s New York crime movie, “The Taking Of Pelham One-Two-Three” which has a similar feeling to “Dog Day” but a much heavier vibe. No question the 1970s were a great decade for crime dramas, and “Dog Day” is one of the best. A Good Enough Movie But How Honest Is It ? This follows a true life incident where two characters called Sonny and Sal rob a bank in New York . Luckily Sonny used to work in a bank because this means that he knows all the tricks like if you use a certain key it’ll trip the alarm in the vault and if you take all the notes from a register this too will raise the alarm . Yeah Sonny knows his stuff so why then I wondered did he and his colleagues wear masks ? As his other accomplice gets cold feet why does he continually call him ” Stevie ” in front of the hostage opening the door and keep calling his partner ” Sal ” in front of everyone ? Is there anything more incompetent than criminals calling each other by their names while robbing people?This tends to contradict Sonny as being a pre meditated robber and paints him more as a lovable klutz doomed to failure. This is my major problem with DOG DAY AFTERNOON . It’s a film that unreservedly manipulates the audience into feeling great pity for Sonny and Sal . I don’t like being manipulated . It’s this lack of ambiguity that stops DDA from being one of the best movies from the 1970s and I doubt if the real life characters would recognise themselves as the people in this movie and I feel too much artistic license has been taken with a bizarre true life story. We’ve seen this story before, but then again maybe not. This is the attitude that director Sidney Lumet takes (as he did with films like 12 Angry Men and Serpico, the later also starring Al Pacino) with Dog Day Afternoon. Bank robbery films are a staple in cinema since The Great Train Robbery filmed in 1903. However this story (not even saying based on a true story, just saying ‘this is a true story’ is enough) is set in 1972, and filmed a couple of years later, at a time when attitudes in society were changing, as was storytelling. Lumet here could get away with things he couldn’t get away with if he tried this in the 50’s; with unapologetically homosexual (but truthful is the key) characters, one of them the lead character; surprises that add to the unconventionality of the style of the film; and an ending that will keep you guessing. Lumet did a lot of good with this movie, and in a small way some not so good; people would look at many bank-robbery pictures that would come after this and size them up to this, as it was almost transparently influential (the ‘Attica, Attica’ tirade is something a child knows years before he actually sees the film). But its the honesty in the truth of the story and problems of the main characters, and in fact the lead up to the robbery and the (unsuccessful) robbery has truth out of it. It is manipulative in a sense, as it is so truthful artifice is almost excluded entirely from the picture. Take when Sonny (Pacino) and Sal (John Cazale) character first whip out their guns in the bank. Their friend can’t take it and wants out. This is a great moment, and the film has them scattered about. In some ways these great parts and scenes make up for the fact that beneath it all is a story that we have seen too many times (the robbers faced with intense media attention, wanting a plane to take the hostages, etc), or maybe not; maybe one has to put the film into context of the period. But a scene, for another example, when Sonny talks to his ‘friend’ on the phone. This is one of those moments where Pacino is of course as always ‘Pacino’, but also totally immersed in the character and the situation. Lumet lets this play for painfully real results. 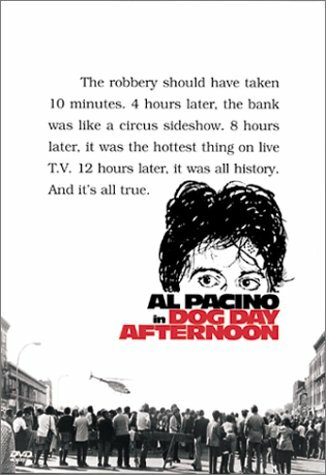 Dog Day Afternoon is one of Lumet’s grittiest successes, as he takes the city he’s made most of his films in, New York, and gives it the right tone, inside the bank and out, for this story of eventuality to unfold. The opening montage, with an Elton John song in the background, really has little relevance to the rest of the film, except to set up mood, and style, and it is a wonderful style (interestingly, the rest of the film aside from this opening is without music, another touch of the gripping realism). In a way, as I mentioned, its almost TOO intense, and too spectacular in the power that it has. This is Al Pacino in his prime, after all, off the heels of Serpico and The Godfather films, with his Sonny loaded with vigor and ambition and delusions of grandeur. John Cazale’s Sal, by the way, is equally convincing in his own right, bringing a level of sanity to some of Sonny’s over-the-top ideas. This film, and its actors and characters and Dede Allen editing, is almost a blue-print for how many other films that would come after this would take. One almost wonders what’s the point of all of it, but when it makes its moments to shine, its dynamite. Quite an intense experience. Lumet’s direction is quite good, and this is easily one of Al Pacino’s best performances. Seeing it makes me mourn for what he used to be. He really needs to fire his agent right now so he can land himself better material than The Recruit and S1m0ne. While Dog Day Afternoon is very entertaining and well made, it does have some major problems. I think its depiction of gay characters, the ones besides Pacino’s, that is, is dated if not offensive. It’s almost like you can hear Lumet standing behind the camera telling Chris Surandon to “queer it to the max!” and “get that wrist limper!” You know he actually got an Oscar nomination for that? The hostages are all over the map, too. Sometimes they’re as scared as hell and sometimes they’re having a ball. It’s never consistent, not even within individual characters. There are a lot of interesting social issues raised, but the politics are a bit murky. Still, Pacino holds the film together so well that these things, even though they are pretty big flaws, seem small. I can’t see how the Academy could choose Jack Nicholson in One Flew Over the Cuckoo’s Nest over Al Pacino in Dog Day Afternoon. The two films are about equal in value, but Pacino comes off as a full character.